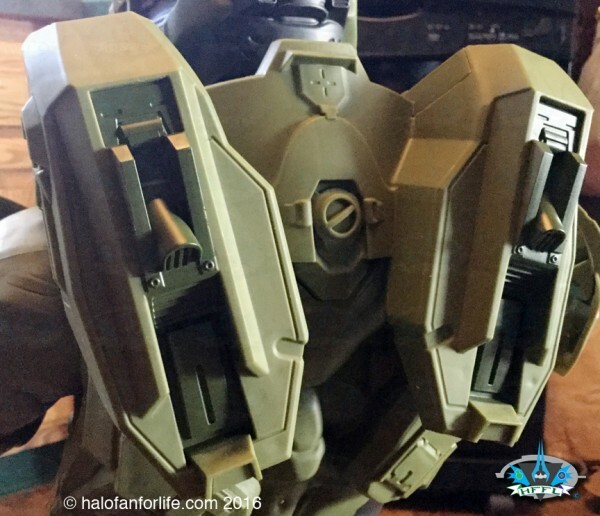 New to the Halo line of toys comes Jakks Pacific. They are known for the HUGE action figures. 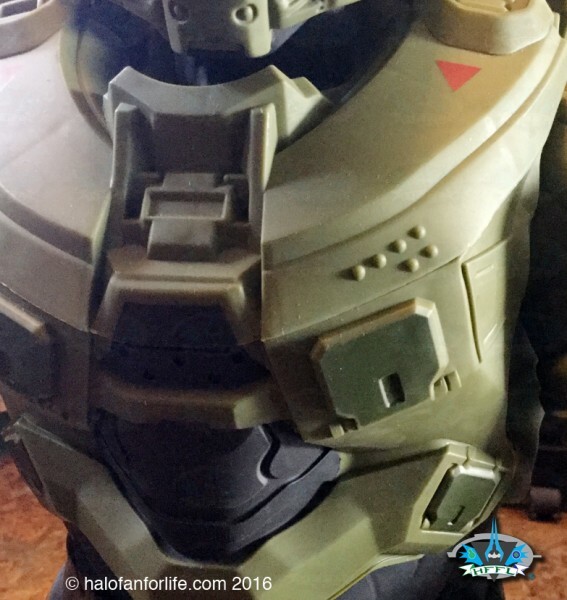 This is their first foray into Halo as a licensee. 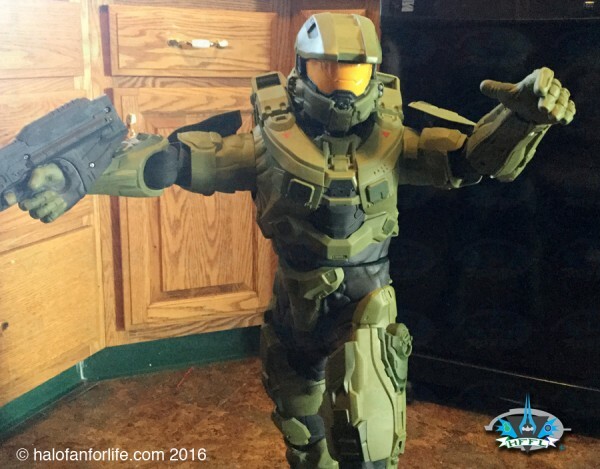 What a great choice for their first figure, none other than Master Chief! Before I get started, let me first say a big thanks to Jakks for sending me not one, but TWO of these. I will be giving one away, so stay tuned for details of that contest. Secondly, I normally do product reviews with a white background. However, this figure is SO HUGE, that I had to set it on the floor. I chose to pose it in front of my dishwasher,,, This way the background was mostly black. kay, those out of the way, let’s get started with the review, shall we? As always, click on pics to make bigger. This is the figure still attached to the base package. As you can see there is a small plastic wrap around the left hand. I guess that’s there to prevent scuffing the plastic while in transit to the retailer. 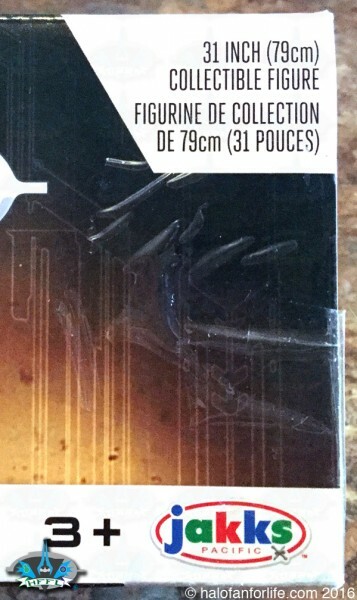 Note that the back thrusters are separate and attached near the bottom back of the packaging. Not quite 3 feet tall, this is still a MASSIVE figure! There is a lot of detail to this figure. Close up pics later in the review will show this off better. As noted, there is a plastic wrap on the left hand. 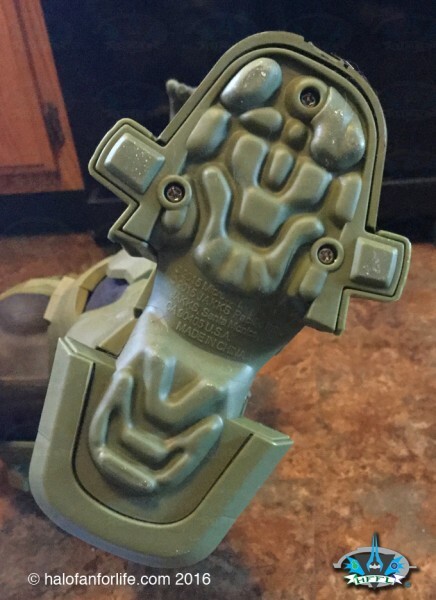 There is also plastic for the right hand (holding the Assault Rifle). The back view shows where the screw holes are. As I do not plan to display him with the backside showing, these aren’t so bad. However, if you display him as a piece that can be seen 360°, then those screw holes might be a detraction. This can’t really be fixed though, given the nature of the toy. You could plug them up with a green putty. Here is the back plate. It’s held to the package by one plastic band. There are three plastic bands in total to cut. 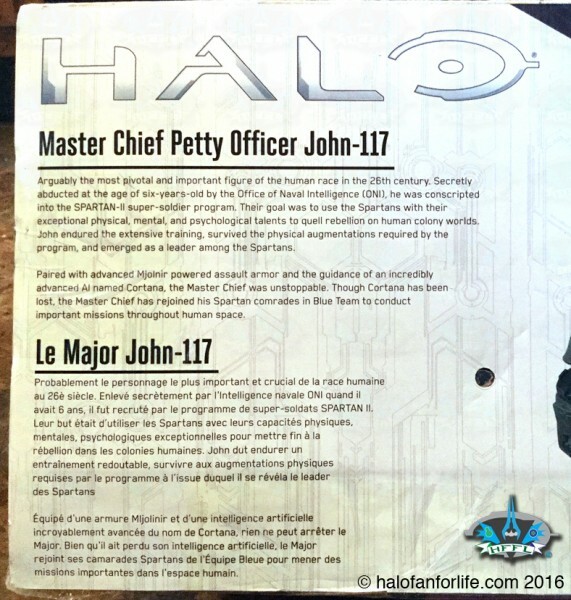 This one and two others at the bottom of the package that hold Chief’s feet in place. They are easy to cut, just be careful. Kids, get your parents to cut these for you. 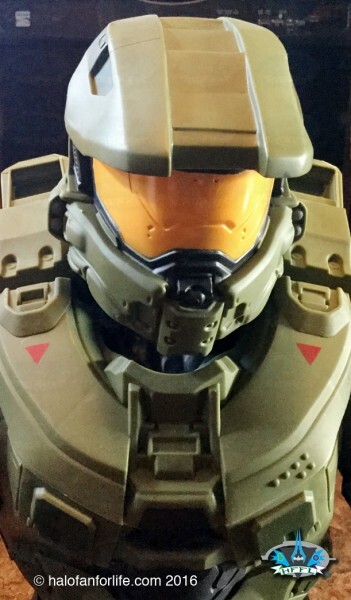 The helmet has a nice amount of detail. The visor is more of a yellow orange than the bronze-isa color we are used to for Chief. The only slight thing I would have liked here would have been metallic ink for the visor. Just something to give off a better reflection. I may add a metallic sheen to this myself after I repaint it a more correct in-game color. This is just my own personal preference though. It’s not a detractor, IMO. The chest is chock full of detail. As you can see the braille 117 is present. A few nice color details help to add depth to the figure. This is the back plate attached. It’s VERY easy to attach. 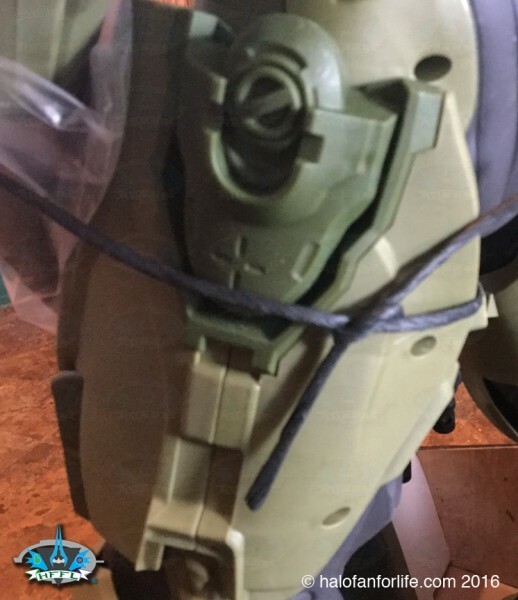 There are two small holes on the back of the figure that the back plate plugs in to. Again, plenty of detail here with a two-toned look as well. 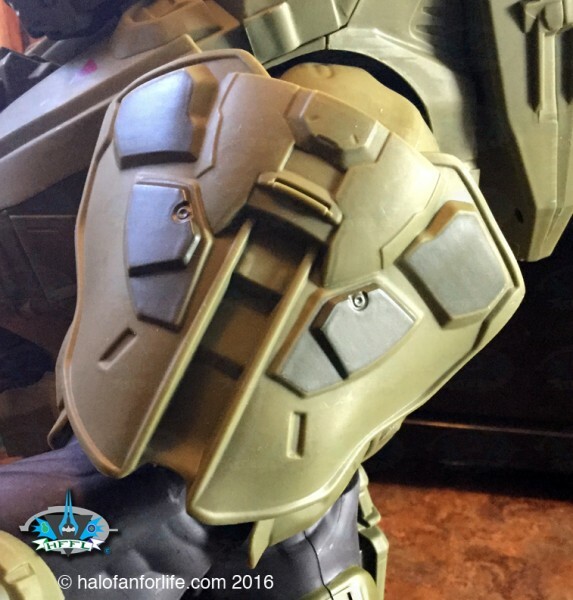 The shoulder armor stands out nicely, especially with those darker green panels. 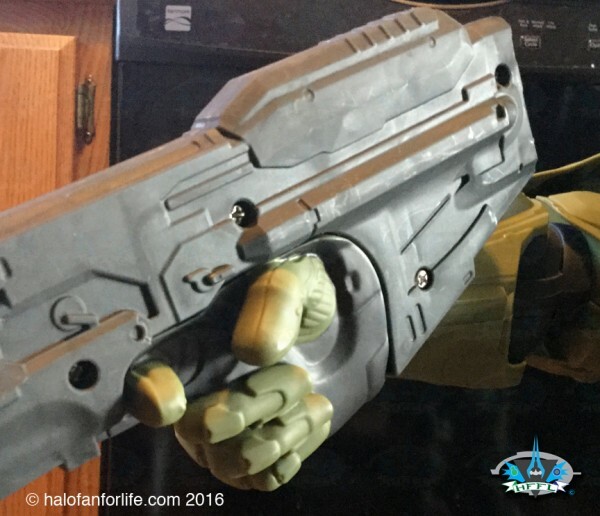 The Assault Rifle is attached to the figure initially by a small tie. This is easy to remove. I just undid the knot and it came right off. You can cut it off too, if you prefer. This shot also shows the plastic sheet separating the arm with the AR from the body. Again, likely to keep from scuffing while in transit and in-store display. Here’s a shot of that tie I mentioned. This is the left thigh. There is also one on the right thigh. 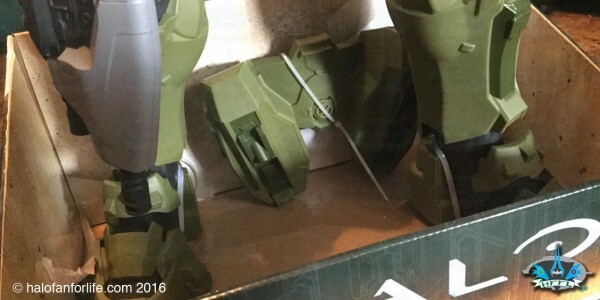 The leg armor is very well detailed. No knee or foot articulation. 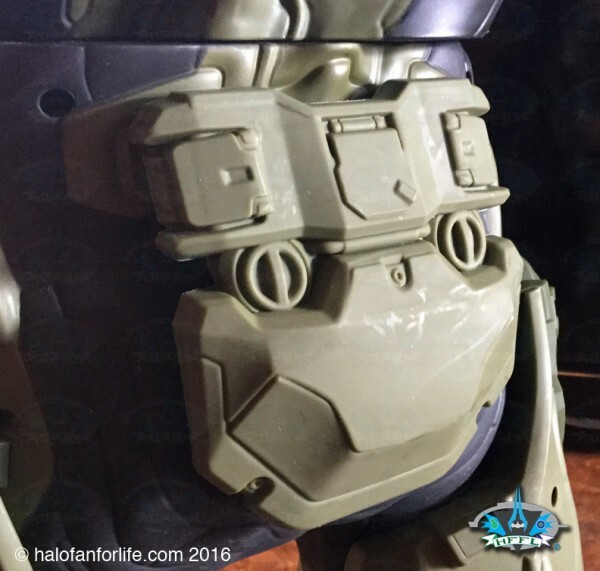 Back of the leg armor shows more detail. Nicely done! Jakks didn’t miss a beat here and also included the footprint of the boot! A detail many might miss. It’s those little things that make toys better! Now let’s talk about articulation. This figure has limited articulation. Let’s go over those points. Chief in a classic pose. Both shoulders can rotate and swivel out away from the body. Same arm also has an elbow joint while the other does not. Both hands can swivel to a point. 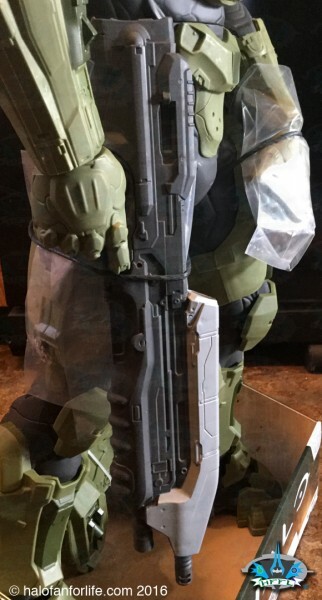 This makes it easy for Chief to hold the AR as shown above. Here you can see that the shoulders indeed swivel out. Also notice the open hand is palm down. The waist also has some articulation. I haven’t tried to spin him all the way around and won’t. Boo Yah! Okay, not really, LOL. Again, showing the shoulder articulation better as well as the waist twisted some. 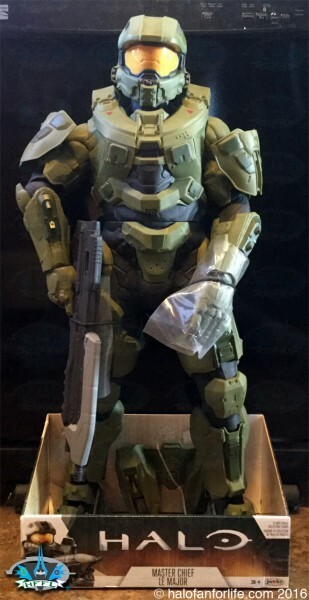 Summary: This is a large Master Chief figure made of plastic. The only metal present might be the screws. I did not try to unscrew these, so I can’t confirm this. The figure has a little weight to it. It has limited articulation for simple posing. • There is very little I do not like about this figure. It’s got a lot going for it, especially at the price point that it is. My only two small knocks to it were mentioned above. I’d have liked a metallic looking visor paint and a removable weapon. Other than those, that’s it. Value: At $50 it’s a great deal. 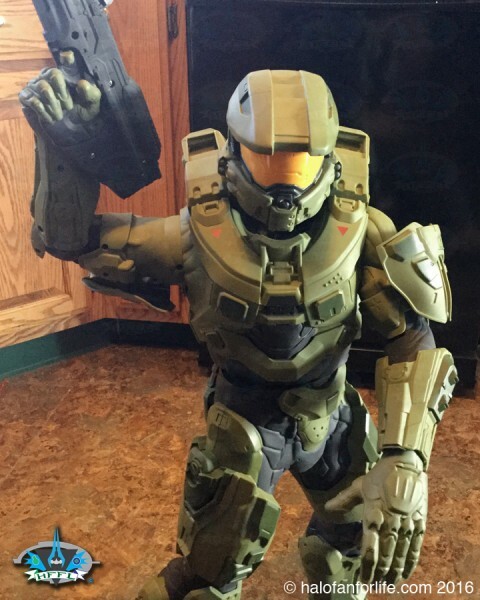 You get a decently detailed figure of Master Chief with some articulation. Now, let’s be straight here folks, this is NOT a Sideshow Collectibles type figure. Those typically go for much more money and are a lot smaller. The Jakks figure doesn’t have full articulation and I’m okay with that. At a price point of $50, I wouldn’t expect full articulation for the SIZE of this figure. I’m happy with the articulation that is there. Do I recommend it? A resounding YES! With one caveat. The package says this is for ages 3+. I have to disagree here. There is some weight to the figure that I can see a small child potentially hurting themselves with, were it to fall on them or if they were to for instance, shove it down steps. Also, there are some small ‘pokey’ bits with the toy that I’d be concerned with around small children. Shoulder armor, fingers, etc. So I would recommend this for ages 7+, though more preferred at 10+. Strangely enough, there is so much detail with this, that someone with a creative mind might be able to cut this apart and make a play suit of armor for a small kid (Halloween costume?). Wouldn’t that be awesome! I do not have a small kid, or I’d try it. Hmm, maybe a small child mannequin? Nah, that’s a bit too expensive, LOL. This entry was posted in Misc toys, posters, etc. by Sal. Bookmark the permalink. Very nice review, can’t wait to here more about this give away. 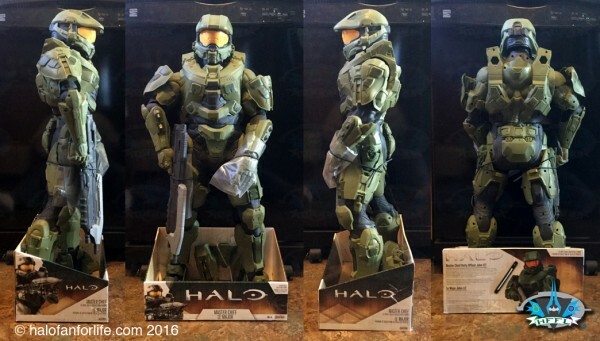 I’m also interested to see if they will continue this line of halo figures. I asked them the same and suggested the Arbiter. If they are only going to do a few figures, then the Arbiter MUST be one of, if not the next one, IMO.